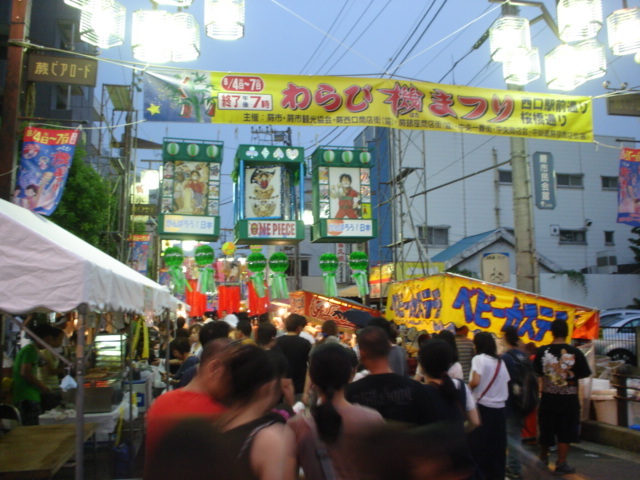 On Friday, I went to the Warabi Matsuri (Festival) for the 3rd year in a row. 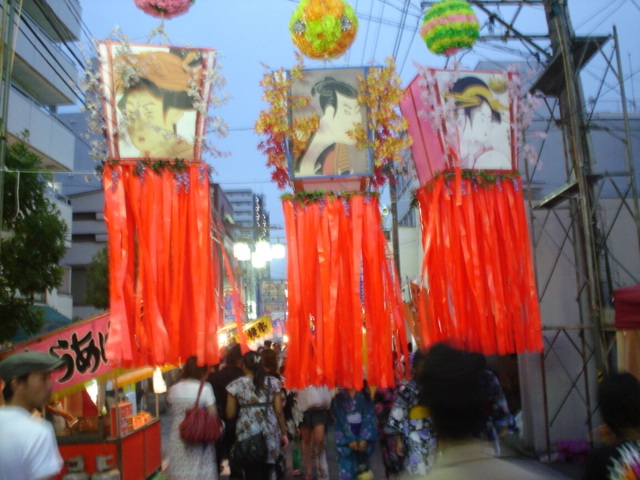 This time, we went right at the beginning of the festival. Very little food was available and they were still putting up the decorations. This is one of the bigger decorations that was still waiting for installation. 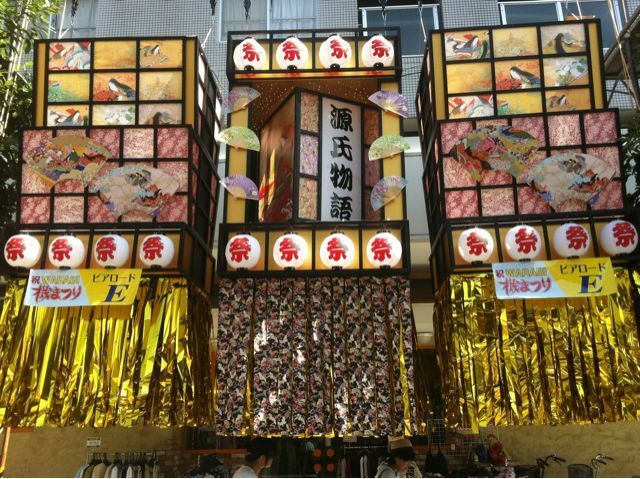 I was standing under this with my head in the gold streamers. It’s Golden Week now, and I went with my family to my wife’s hometown to visit her family and celebrate our daughter’s 100th day. 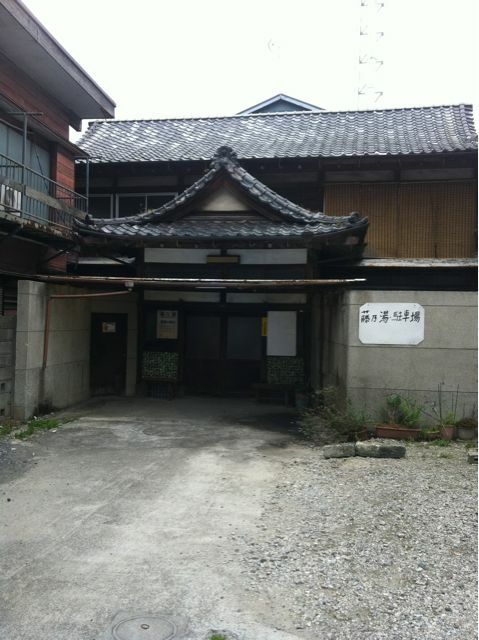 On our way there, we walked past this old public bath, or sento. This particular public bath is quite old-looking. Not many public baths are still open, but this one is. 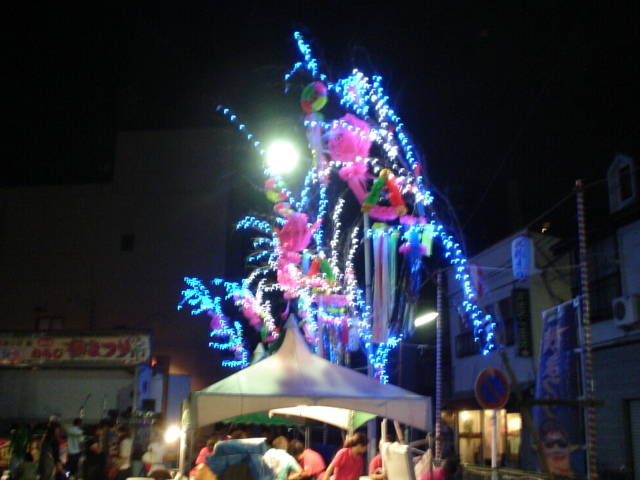 On August 7, my fiancee and I went to the Warabi Matsuri in Warabi, Saitama with her sister. Last year’s festival was pretty good, and I was looking forward to eating lots of festival food this year. Unfortunately, we only had an hour until the end of the festival, and there was a pretty bad storm with spectacular lightning. The rain forced us to head for cover while we tried to eat. I had hoped to get pictures of the food stalls where I bought food, but thanks to the rain, I kept my camera safe. However, I did get two photos! What did I eat, you ask? I had barbecued corn on the cob, jagabataa (potatoes and butter), yakisoba, karubi steak (beef rib meat) on a stick, and some flat gyoza-like food. My favourite festival food is the potatoes. Warabi has a large foreign population, and it’s one of the smallest and most densely populated cities in Japan. There are plenty of Turkish people there, and at the festival, they sold kebab sandwiches. 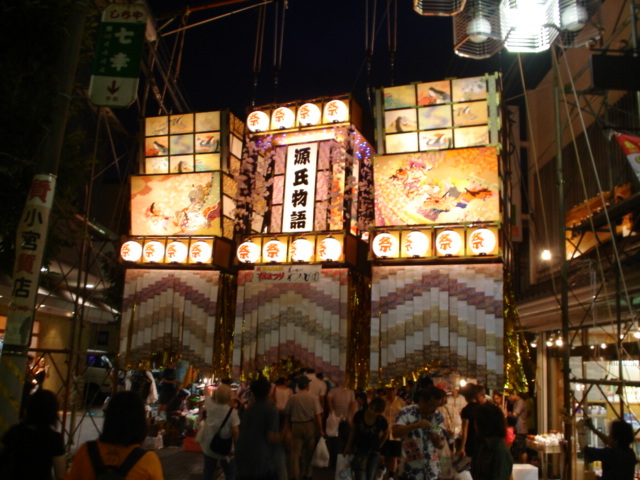 Why did we go to Warabi for the festival? It’s my fiancee’s hometown. Enjoy the two pictures. 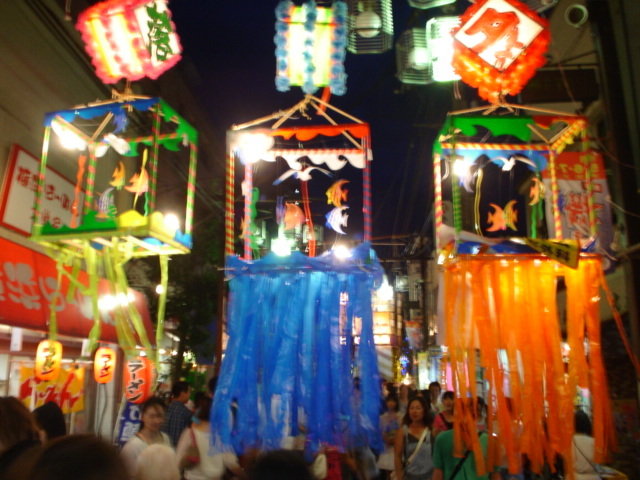 Warabi Matsuri is very colourful. Unfortunately, the skies were stormy. Enjoy the colours. The focus wasn't very good, thanks to darkness and rain. 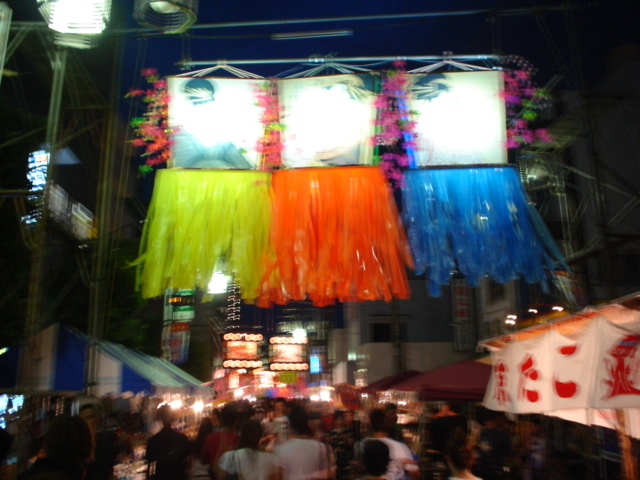 On August 8, 2010, I went to the Warabi Matsuri (festival). It’s in Warabi city in Saitama. It was cooler than it had been recently, so that was nice. 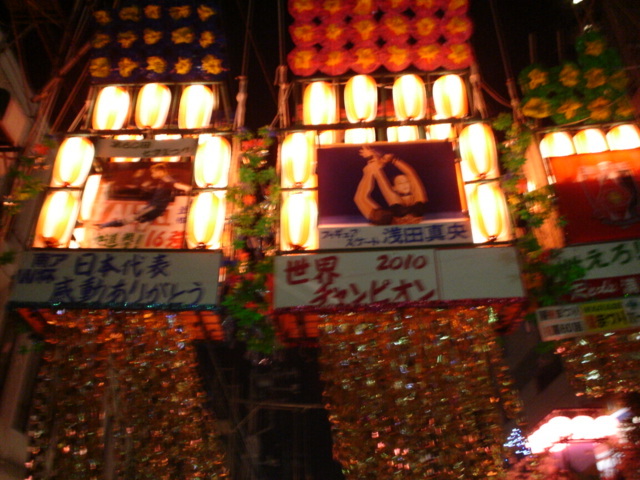 This festival is held annually, and this year was the 60th time it was held. Sunday night’s festivities were mostly food and a live band. I ate karaage (fried chicken), a frankfurter sausage and some jaga-butter (potato and butter). I wanted to try more food, but I was too full! I didn’t take many pictures, but what I did take were mostly blurry. Sorry about that. I have to learn to stop moving while I take a picture. Enjoy the photos! 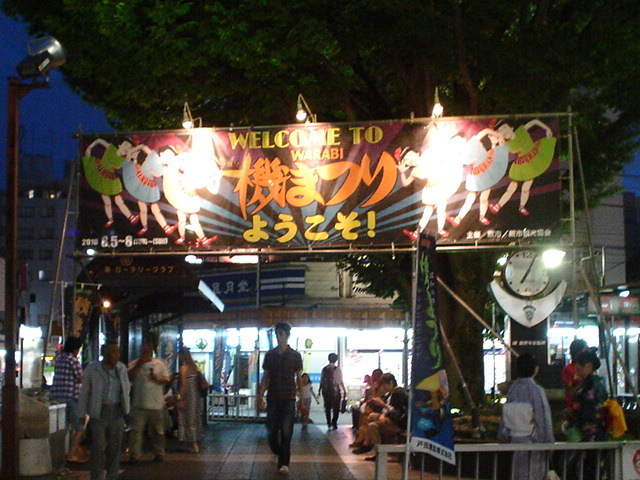 A nice welcome to the Warabi Festival. Nice bright colours. Sorry for the blurriness. It was pretty crowded at this festival. 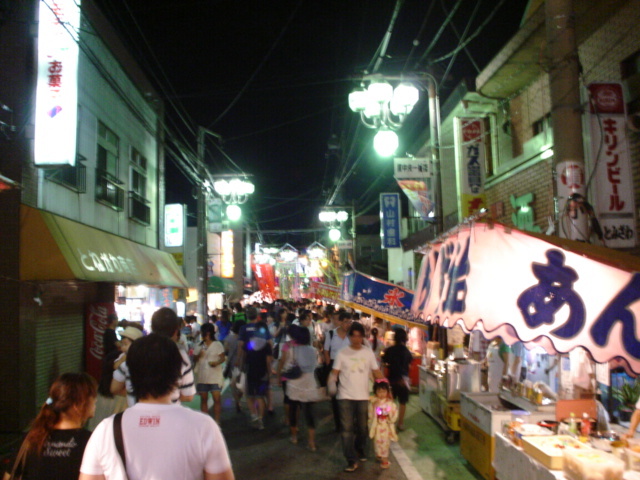 The street is lined with food stalls, where you can buy great food. Another blurry picture. The one on the right is Mao Asada.